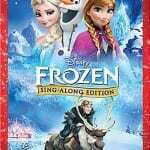 The Disney Store has begun taking pre-orders for a new edition of Frozen on DVD – the Sing Along Edition. Currently only available on DVD, the new edition features the same version of the movie which was released to theatres this February. According to Disney Store, the new DVD is slated for release on November 18 this year. It is currently unknown if this edition will feature both versions (normal and sing-along) or just the aing-along version. We also know that a new “never-before-seen” bonus feature will be included on this edition. The DVD cover features the same artwork we’ve seen before, only this time with a “Sing-Along Edition” tag. The cover also proudly proclaims that Frozen is the “#1 Animated Film of All Time”. Keen-eyed Blu-ray fans may have also noticed a new Frozen trailer attached to this month’s Disney Blu-ray releases of Disneynature Bears, Hercules, Muppets Most Wanted, Tarzan and others. We’ll have the official announcement with more details and the trailer up soon, so stay tuned! 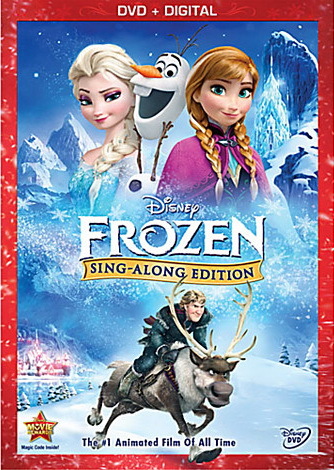 [UPDATE 8/12/14 11:14AM PST] According to a press release by Disney, the Frozen Sing-Along Edition will be released just in time for the holiday season on November 18, 2014.